Please join us for the region's biggest and best TubaChristmas event on Friday December 7th at the Municipal Arena in downtown Kansas City, hosted by the Kansas City Symphony. Registration is already filling up fast, so please don't delay getting your registration in. We're going to have an amazing event and hope to see you there! Last edited by Frank Byrne on Wed Oct 17, 2018 12:17 pm, edited 1 time in total. I'm aware of a bookmark in your illustrious career. rather than maintaining, and - further - would be virtually recession proof. Thanks very much, Joe! Come on out and join us for TubaChristmas. It's going to be special. Frank Byrne wrote: Thanks very much, Joe! Come on out and join us for TubaChristmas. It's going to be special. I realize that it is an epic and record-breaking annual event. I do have relatives there (retired highway construction contractors) who designed/built (among other things) Highway 10 between KC and Lawrence. I just don't think that I could quite be back in Memphis and ready to rehearse by 9 A.M. on Saturday. 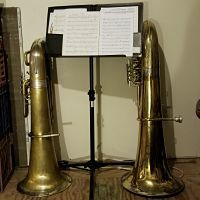 Since it will coincide with Pearl Harbor Day (Dec. 7) and will be the 77th anniversary of "a date that will live in infamy", I wonder if one of your hundreds of participants might write a short tuba/euphonium arrangement of one of the main themes from the Rodgers/Bennett "Victory At Sea" to play ? Played in TC KC last year. Was very impressed with the organization and level of participation. Merry TubaChristmas ! Please make plans to join us for Kansas City's biggest and best TubaChristmas ever. In addition to the usual carols, we will have the WORLD PREMIERE of a new original chorale for tuba/euph ensemble composed by James Barnes. Jim will conduct the world premiere with the group and it will be certain to make the event even more special. Well I might take a train, I might take a plane, but if I have to walk I'm going just the same. So. did you get more than 3 people?